I ran across an intriguing piece of information today regarding Christmas & the Bible back in 1952. Of course, Harry Truman was the president during this period and if you didn't already know, this was also when the new RSV (Revised Standard Version) of the Bible came out. In fact, Truman happily recieved a copy from the publishers at the White House. This was big news. It was such big news because, going into Advent, a lot of Christians argued that this new translation was a direct assault on Christmas. Why? Well, one reason is because of how it rendered Isa. 7.14, you know, the verse where the traditional rendering of "virgin" was now translated as "young woman". In turn, this led to a re-reading of the Gospel accounts and Mary's conception and birth of Jesus. A firestorm debate arose over whether or not Mary's pregnancy was of supernatural origin or human agency. According to the RSV, said some, Mary had been relegated to a "young woman" and the infancy narrative, the nativity, Christmas, etc. were now all under attack. 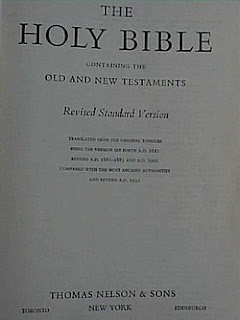 Even the Air Force training Academy dubbed the RSV the "Communist Bible". Just a little tidbit of history that I found intriguing and thought I'd pass on. Any thoughts? *See: Thuesen, Peter J. (1999) In Discordance with the Scriptures: American Protestant Battles Over Translating the Bible, New York: Oxford University Press. and Whiteley, Shiela. (2008) Christmas, Ideology and Popular Culture, Edinburgh: Edinburgh University Press. Interesting, I wouldn't have guessed that it would cause a stir like that. Thanks for that tidbit, Michael. It seems to have fueled the "liberal" vs. "conservative" debates at that time even more and evidently only widened the gap between the two theological bases. I wonder, too, if this is contributed to so much of the fundamentalist backlash that led to us having "KJV-onlyists"? Certainly, it had to have some affect on that I would think. Why was it translated this way? I do not read ancient languages so as someone who doesn't, how do we know which translation is correct? Michael, could you, as a student of language, help us out with this? Chris, it is quite interesting but I could definately understand the big stir. People look for any minute discrepancy like that to pick apart our faith. And, honestly, I can understand why something like that could have a big impact...if the conception is changed from Divine to human. It reminds me of some KJV-onlyists today like Gail Riplinger. Certainly! I will do a post or two on this very matter. I watched the video; just ridiculous. I think, however, that comparing this "titanic/NIV" video to people getting upset over the morphing of "virgin" to "young woman" is quite a different ball game. Nonetheless, her exgesis is horrendous!! !